Linking up with Doodle Bugs Teaching and Teaching Maddeness for the Friday linkies! It can be your original idea, something you read about somewhere, a schoolwide incentive, etc. The possibilities for this linky are endless! I can't wait to see what everyone does in their classrooms! I think this time of the year is a perfect time for this linky especially with spring fever-we all need a bag FULL of magic tricks! You don't even have to R.S.V.P.-just come to the party! My new linky button!!! Isn't it gorgeous and sparkly??!! Michelle from The 3am Teacher really captured my style! Can't wait til tomorrow! 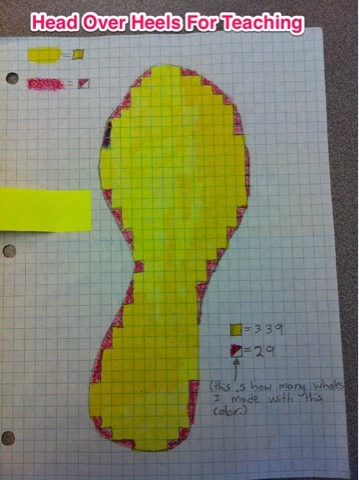 As a fun activity and to help my students calculate area I had them take their shoe off and trace it on grid paper. (I try to incorporate shoes whenever I can!) They could use any method to figure out the area of their shoe. This creative student shaded in all the whole squares one color and the 1/2 squares a different color to make it easy to calculate. We traced our shoes during class and my students completed this at home or during free time. It was due at the end of the week. Need a five minute filler that's purposeful? This book is filled with 200 "fun facts that happen every 60 seconds" and also includes quick activities. Did you know every minute 20,820 Jelly Belly jellybeans are produced? Or that there are 2,000 thunderstorms occurring on Earth every minute? Each fact is supported with additional information and kids love it! Interesting non-fiction reading! 4. Booked our Disney Cruise-great deal for Florida residents...set sail in 23 days! Nothing compares to a Disney Cruise and my kids can't wait. 5. Garage Sale Tomorrow: Cleaning out and hopefully going to earn some extra spending money! I've only had one garage sale in my life and I'm not looking forward to the wheeling and dealing! Any tips for a successful garage sale? Love your idea for your linky. I always love hearing how others motivate their students. Can't wait to see everyone's posts. Love, love, love the button! :D Michelle did a fabulous job! What a terrific idea for a linky! Can't wait to pop back and read all of the ideas. I love your measuring area idea! Such a fun idea for your linky! I could definitely learn a few new tricks for this class :) Excited to come back tomorrow! Check out the Giveaway at Lucky to Be in First! How stinkin' cute is that button for your linky! Precious!! Totally you!! I love it!! Awww, a Disney cruise! How fun! I've thought about doing one with my family when the kids are a bit older. You'll have to let me know how it goes! I won't link up til Monday, I hope that's ok? I am so glad that I finally noticed ya as another 4th grade blogger! Best of luck on your linky party tomorrow.